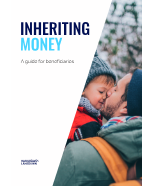 Deciding what to do with any money or investments a loved one’s left you might not be the first thing on your mind. This guide is not personal advice. We hope this guide will help you to better understand your options, but it shouldn’t be taken as personal advice. Investments can fall as well as rise in value so you could get back less than you invest. Tax rules can change and their benefits depend on your circumstances. You should seek advice if you’re unsure of what to do. It’s important you understand your options so you can make the best choice for your situation.